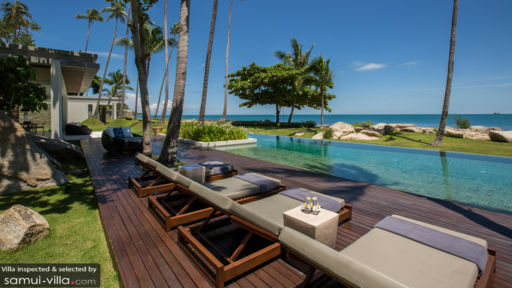 Set next to the Golden Pagoda at Laem Sor Beach, Villa Malabar occupies a prime seafront location along the tranquil and scenic southern shores of Samui. A total of eight guests may reside in the villa’s four bedrooms. The commodious master bedroom overlooks the sea, and features an enviable bathroom equipped with a terrazzo bathtub, twin vanities and a rain shower. Two bedrooms are housed in a separate seafront pavilion, while the fourth bedroom is set in the main pavilion. Guests will enjoy panoramic views of the ocean from the bedrooms, except for the fourth, which offers partial sea views. All rooms are tastefully appointed, and come furnished with ceiling fans, air conditioners, king-sized beds, crisp linen and eye-catching art works. Make a splash in the spacious rim flow pool along the front lawn of the villa; there’s enough space for avid swimmers to do their routine laps, as well as a shallow area for the little ones to play around in. After a rejuvenating swim, dry off against a beach towel before relaxing against one of the many sun loungers lining the wooden deck. Your littles ones will be clamouring for a seat on the swing, tied to a shady tree along the beach. Make sure you do not miss out on catching a spectacular sunset show during your stay. A breezy sala, set next to the pool, offers a comfortable sunken seating area - the perfect spot for enjoying an icy cocktail and breathtaking coastal views. 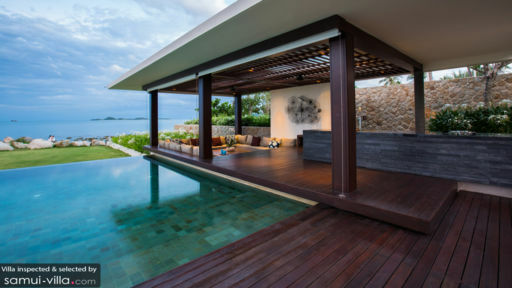 Villa Malabar’s open plan living spaces allow guests to fully embrace indoor-outdoor living. Materials, such as stone, wood and concrete are heavily featured in the interiors, alongside a palette of neutral hues. These minimalist design elements ensure that the picturesque surroundings of the villa are cleverly accented. Guests may opt to chill out in the well-equipped media room, work off calories in the fitness room or catch up on work (if you really must!) in the quiet study area. Villa Malabar offers a daily breakfast service. A baby cot is available for use free of charge. Airport transfers and personal chef services are available at additional cost. 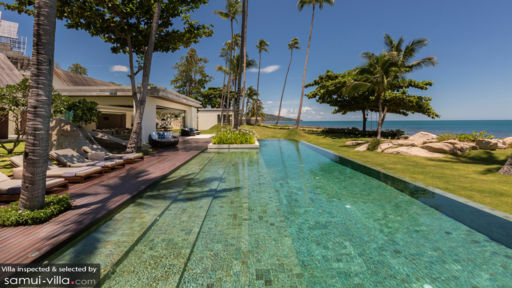 Villa Malabar is located along Bang Kao Beach in South Samui. Scenic and picturesque, this part of the island is ideal for holidaymakers seeking a slow paced and relaxing getaway. Your villa enjoys direct access to Bang Kao Beach, a palm-fringed coast with postcard-perfect scenery. The beach is quite remote, and the sea conditions aren’t ideal for swimming. Other beaches located nearby include Taling Ngam Beach and Lamai Beach. The former offers a quiet ambience and incredible sunsets, while the latter is known for its vibrant and varied dining and nightlife scene. Spend quality time with friends and family at attractions like the Muslim village of Hua Thanon; it has a traditional charm and offers a glimpse into the way of life on Samui before tourism developments took place. Other attractions that offer a great family experience include Pagoda Khao Chedi, Wat Khunaram, Hin Ta and Hin Yai Rocks and Lamai Viewpoints. When it comes to dining, Bang Kao and its neighbouring coastal towns offer something for every vacationer - there’s Thai fare, fresh seafood catches, European fare, organic vegetarian dishes and more. We’d recommend Vitamin Sea Restaurant for its waterfront setting and Mediterranean fare, Sweet Sisters Cafe for its variety of vegan and vegetarian mains, Villa Chocolat for its decadent chocolate treats and Thong Krut Fisherman’s Village for its selection of seafood restaurants.